The house was built in 1890 in a typical Ottoman architectural style. One part of the building which was considered as the private area of the house (haramlek) is dedicated to accommodation and offers 23 rooms overlooking the oriental style lobby. 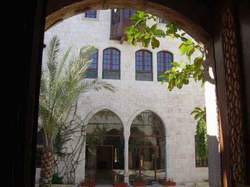 Orient House Hotel Hama has a summer terrace which overlooks Old Hama; there is an exhibition hall within this hotel which displays local tradition handicrafts and textiles. Whether the rooms, building itself, and ambient neighborhood, this hotel presents a documentary on Hama's history. One can have a delicious meal (local oriental meals from Hama city or Occidental meals) served by Orient House Hotel Hama's restaurants on a terrace that overlooks the old Hama area, around the courtyard, or inside this cozy hotel. A coffee shop, a restaurant, a summer terrace and a traditional loom room.